The high pressure ridge is a little further off the coast. Today and Tuesday we will have sunny skies with gusty north winds continuing through midday Tuesday. Wednesday another low pressure trough will drop southward along the Canadian coast and into the Great Basin. We will see a few clouds from this system with isolated light showers over the mountains north and east of the valley. Sunny Thursday and Friday with gusty north winds on Thursday. Friday looks like the warmest day this week with daytime temperatures 10 degrees above normal. 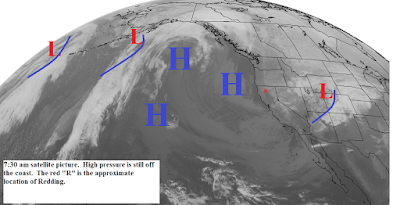 The map below for Saturday shows another low pressure trough dropping southward along the Canadian coast. The GFS (U.S.) model keeps this system along the coast and moves it into the Great Basin. The other models pull it back to the west and then across Northern California Sunday and Monday. This further west solution will be much wetter and colder for Northern California.